This creamy white sauce is made using 2%fat milk, whole wheat flour and olive oil without using any cream/cheese. You can enjoy it with your favorite pasta/spaghetti (link1/link2) or even in sandwiches. I used fresh mint paste in the sauce for the flavor in place of dried herbs. I blanched mint for few seconds in hot water but it can be used without blanching as well. 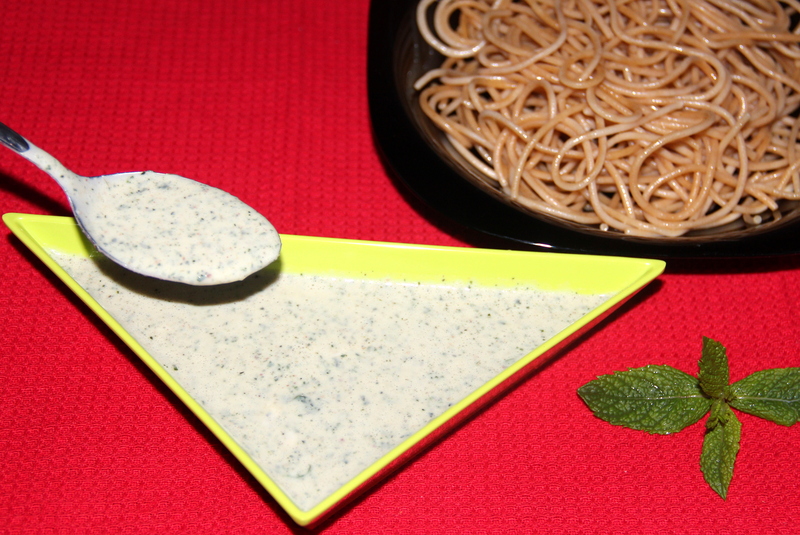 enjoy this minty white sauce on your favorite pasta dishes. Blanch mint in hot water just for 30seconds-45second drain completely and squeeze excess water and blend it in the food processor without adding any water. Now add olive oil in a heavy saucepan over medium heat, blend in the flour, keep stirring and cook for 2minutes to leave the raw flavour of the flour. Seasoning can be personalised as per the taste. Posted on August 21, 2014, in Dips, Dips, Indian, International and tagged Chitras healthy kitchen, drchdietfood, Healthy sauce for pasta, Pasta Sauce recipe, Spaghetti sauce recipe. Bookmark the permalink. 17 Comments.